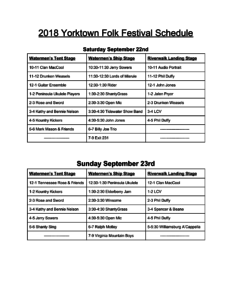 Join us for our 5th Annual Yorktown Folk Festival on September 22 and 23. This festival features over 25 performing groups and soloists. Sponsored by the Yorktown Arts Commission and local businesses, this event features musical artists including our own ShantyGrass, and headliners Billy Joe Trio and Exit 231 on Saturday, and headliners Ralph Motley and Bill Jenkins and the Virginia Mountain Boys on Sunday. Other musician artists include LCV Project, Jalen Pryor, Jerry Sowers, Elderbery Jam, Mingo, Phil Duffy, Mark Mason and Friends, Winsome, Spencer and Beane, Clan McCool, Lords of Misrule, Bennie and Kathy Nelson, Peninsula Ukulele Player, Field Musick Virginia, Williamsburg A’Cappella, and others. In addition to musical performances, we are hosting three very different dance teams: the Morris dance team named the Drunken Weasels, rose and Sword Academy of Irish Dance, and the Kountry Kickers. But, that isn’t all…we are also having face painting, children’s crafts, sing-a-longs and lots of other fun-filled family activities. 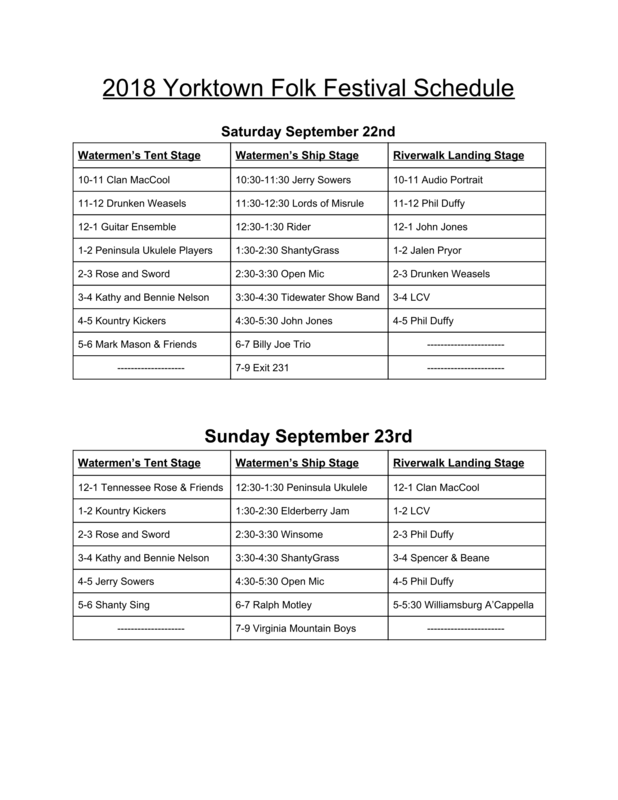 We’ll host all of these music, dance and children’s activities on our two large stage areas at the Watermen’s Museum as well as at small performance areas on our beach and in the Green Space adjacent to the Fountain in the Yorktown Riverwalk complex. You can follow our roving balladeers from place to place to experience all of the visiting performances. The fun starts Saturday at 10 AM and again on Sunday at noon. Come join us for a wide range of music, dance, good food, a cool beverage, or even some ice cream from our friends at Ben and Jerry’s in Yorktown.